The School of Physics and Astronomy at Monash University is leading the world in ground-breaking Physics and Astronomy research. This research is conducted within four broad themes, as described below. Information about individual researchers can be found organised by Research Area - researchers are often listed under more than one area. Further information about researchers can also be found under the Research Groups or Centres to which they belong. Astronomers and astrophysicists in the School are exploring the Universe – from the Big Bang and first stars to the largest cosmological scales. The School hosts the Monash Centre for Astrophysics (MoCA), which is one of the most diverse astrophysics research groups in Australia. Major areas of research include: active galaxies, astrophysical fluid dynamics and magnetohydrodynamics, galaxy evolution, first stars, the formation of stars, stellar evolution, stellar nucleosynthesis, nuclear astrophysics, chemical evolution, galactic archaeology, supernovae, supernova remnants, neutron stars, stellar transients, supermassive black holes, high energy astrophysics, gravitational wave astronomy, stellar and planetary dynamics, and exoplanets. Our researchers utilise major observational and supercomputer facilities and we are involved in planning for the next generation of observatories, such as the SKA and Giant Magellan Telescope. The School is also a member of the Joint Institute for Nuclear Astrophysics and has close collaborations with the Center for Nuclear Astrophysics at Shanghai Jiao Tong University. Equipment in one of our BEC labs. In the 21st century, we are poised to take advantage of a new quantum revolution – one which will allow us to, not only understand the behaviour of atoms, but to engineer and control quantum states of matter and light with unprecedented precision, as in the emerging area of atomtronics. Researchers in the School are tackling some of the most profound questions in science, such as the origin of space, time and matter. We study the ultimate building blocks of nature - the basic elements that make up our universe and the physical laws that govern them. Our research encompasses both standard model physics, such as electroweak interactions, quantum chromodynamics, which describes quarks and gluons, and physics beyond the standard model, including: dark matter, dark energy, supersymmetry, the origin of neutrino masses, matter-antimatter asymmetry extra dimensions and quantum cosmology. As a major partner in the ARC Centre of Excellence for Particle Physics at the Terascale (CoEPP), we conduct research in collaboration with leading groups world-wide, including CERN - home of the Large Hadron Collider. Imaging and computational sciences have driven discoveries in materials science, biological sciences and medicine. The School is a leader in imaging with light, x-rays and electrons. 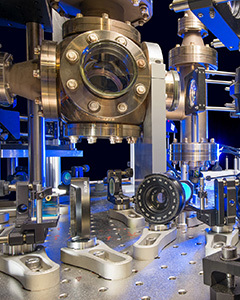 Using world-class imaging facilities in the Monash Centre for Electron Microscopy (MCEM), the New Horizons Centre and synchrotron radiation facilities in Europe, Japan, the United States, and at the Australian Synchrotron (adjacent to Monash), we are carrying out research that is positively impacting on the future prosperity and health of our nation. Our insights with x-ray phase contrast imaging of lung aeration at birth have provided better care for infants born preterm with under-developed lungs, thereby increasing survival rates. Other research, focused on imaging the airways during delivery of a treatment for Cystic Fibrosis, has improved our understanding of this genetic disorder. Researchers using the world's most advanced electron microscopes in MCEM are developing new ways of imaging and designing advanced functional materials. From atom to device and from molecule to organism, physics has a critical role to play in 21st century technology and biology – it is central to the development of tools and insights that will enable new discoveries and for the understanding of complex systems.